The greatest wide receivers in Sun Devil history were J.D. Hill and John Jefferson. 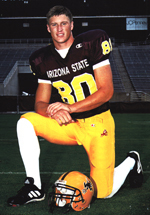 They are joined on the All-time ASU team by Todd Heap, the greatest tight end. Although not a criteria for making this team, it's noteworthy that all three were first round draft picks by the NFL. According to Dean Smith's book The Sun Devils: Eight Decades of Arizona State Football, some call J.D. Hill "the greatest natural athlete in ASU football history." And those who remember him in the maroon-and-gold are quick to agree. Following coach Larry Kentera from Stockton, CA to Arizona State, Hill was an important contributor on the 1967-68 teams. After missing the 1969 season, Hill starred on the 1970 Sun Devil team, one of the top five teams in ASU's history. Hill caught 58 passes for 908 yards and 10 touchdowns as the Devils finished the season ranked sixth in the nation at 11-0 with a Peach Bowl win over North Carolina. Hill was drafted fourth overall in the 1971 NFL draft by the Buffalo Bills (the second-highest an ASU player has ever been drafted). Hill experienced troubles after his football days ended, but turned his life around and is now running Catch the Vision Ministry, whose focus is mentoring youths and encouraging and supporting recovery. "James was so gifted and very intelligent. J.J. had so much enthusiasm and was able to go up against bigger defensive backs and come down with the ball. He didn't have very big hands, but he had great concentration. And the crowd would always go crazy when he'd go over the middle, catch the ball, and take a big hit." A native Arizonan, Todd Heap signed with ASU in 1998 out of Mesa Mountain View High School. He played as a true freshman and "began his Sun Devil career by snagging a 15-yard touchdown pass with one hand in the first quarter of ASU's season-opener against Washington". Heap was a first team All-Pac-10 selection in 1999 and 2000 before leaving a year early to enter the NFL draft. Unfortunately, Heap's tenure at ASU coincided with the decline of the Bruce Snyder era, and his teams never won more than six games in any season. However, Heap did finish with a 2-1 record over the Wildcats. Picked with the final selection of the first round in the 2001 draft, Heap joined the Baltimore Ravens where he continues to be one of the NFL's most dominant tight ends. In response to an inquiry, I believe Charley Taylor (3rd overall pick by the Redskins) was the highest ever a Sun Devil was drafted.